Traffic authorities in Spain are planning new regulations covering hoverboards, or electric skateboards – including speed limits. The General Directorate of Traffic (DGT) wants to keep hoverboards as a form of transport for which a licence is not needed, unlike motorbikes and cars, but says their users will still be subject to alcohol limits and drug bans, and will be tested in the same way as drivers. They would also be restricted to 25 kilometres per hour. These measures have come under discussion in light of the first pedestrian death caused by a hoverboard, this week in Esplugues de Llobregat (Barcelona province), when a 92-year-old lady walking along the pavement was mowed down by two young people riding one electric skateboard. 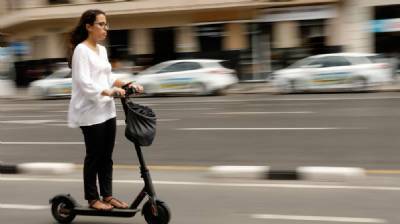 A rising number of incidents involving these ‘vehicles’ has been reported, including a recent case of a hoverboard being ridden at 70 kilometres per hour on the pavement alongside the Avenida Diagonal in Barcelona – faster than the speed limit for cars in the area. DGT director-general Pere Navarro says local councils have been asking him to set legal regulations for hoverboards in light of their rapidly-increasing presence in cities. He has opted to set a basic framework and leave it up to individual councils to decide whether electric skateboards should or should not be banned on pavements or in pedestrian zones, and where, and whether or not to set up dedicated lanes or parks. As yet, given that hoverboards are not ‘motor vehicles’, their users are not required to hold compulsory third-party insurance cover, although this may change in the future since this method of transport is still capable of causing injury or damage for which the victims should have the right to compensation.